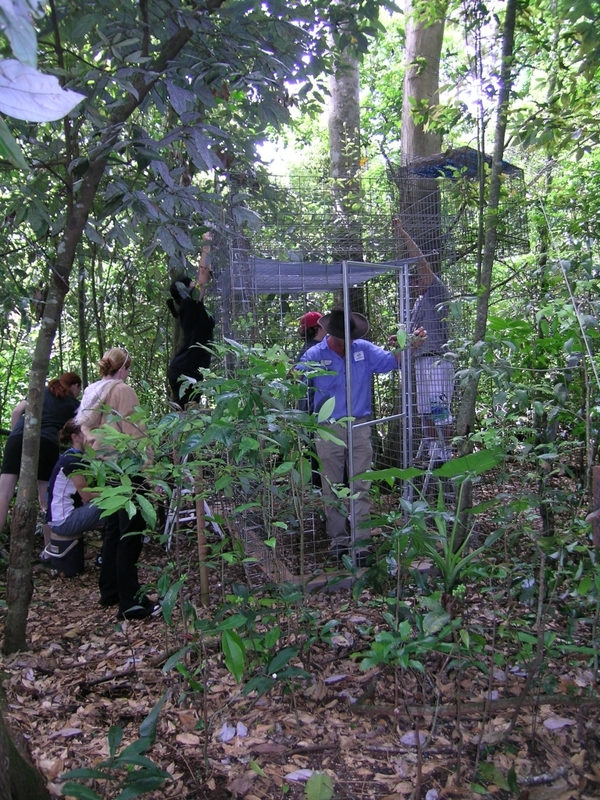 We built the present release cage in 2007 with the help of a Green Corps team, through Conservation Volunteers Australia and Atherton Shire Council. The team cleared the track into the colony, and carried in all the building materials – heavy railway sleepers, fencing panels, rolls of wire mesh and wheelbarrow loads of trench rock. It was a case of ‘many hands make light work’ with 10 Tablelands youth and their team leader Carlo taking 2 days to complete. 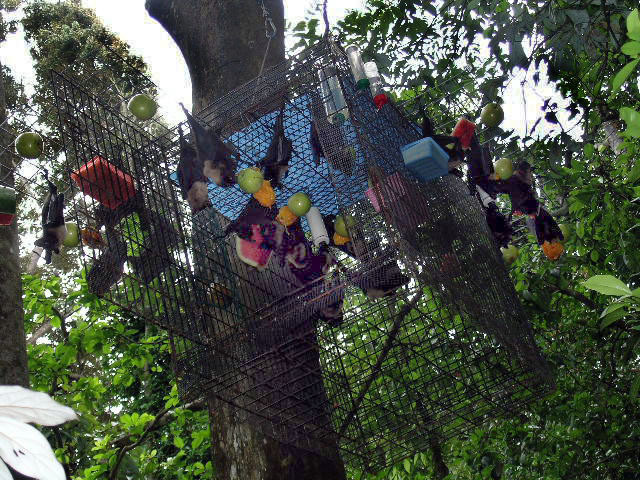 Most of the materials for the cage were recycled. 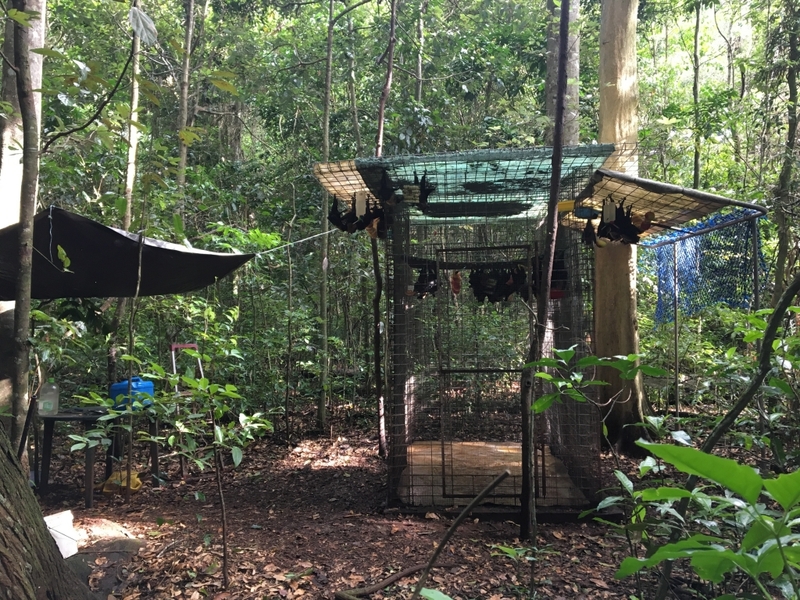 It was designed with a ceiling about 50 cms lower than the roof to protect the bats’ feet from predators, and allow the outside bats to hang at a good height above the ground. We then need a small ladder to get the food up. There is a waterproof roof of UV stabilised plastic, and a floor of outdoor anti-slip vinyl. We scrape up the waste each day and remove off site. We usually start taking the pups out in late January to mid February. 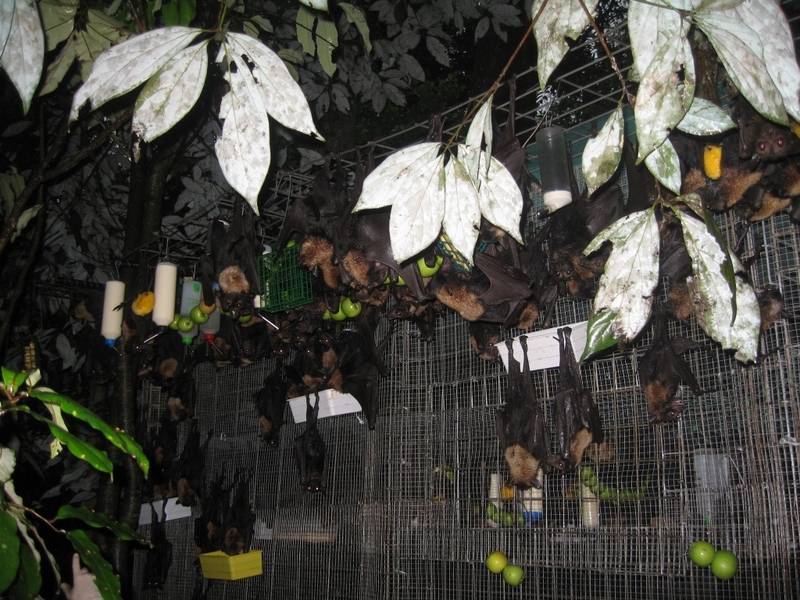 The first batch remain in the cage for about 5 days depending on weather, then they are let out and the next batch brought out. Initially the pups must be a minimum size of 145mm forearm and 450gms. 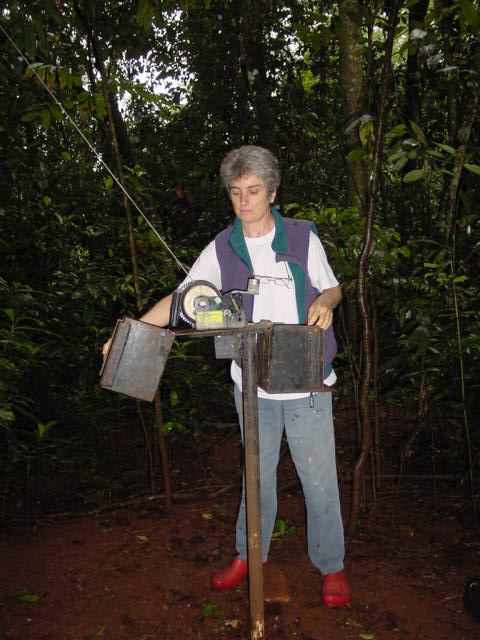 We follow this procedure until all the bats are out at the release site and living free. The last bats to go out are usually a little smaller than the first, weights down to 350gms and forearms down to 135mm. It usually takes about 2 months to get all the orphans out to the release site becasue of the big disparity in ages. Any pup smaller than this is kept over for the following year. We continue to feed daily for at least 4 weeks after the last lot of orphans go out. This is well into our wet season, and so the the rate at which we begin to cut back the food varies with the weather. 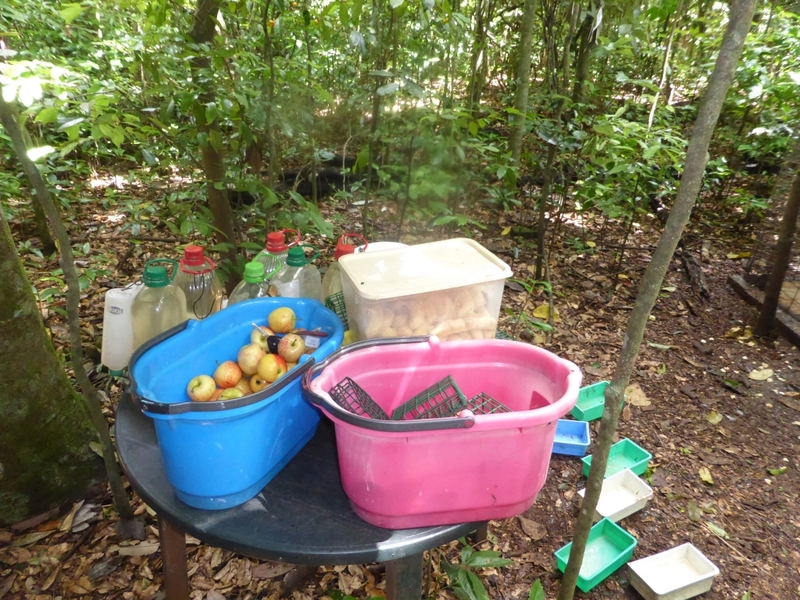 The more cyclones and wet weather, the more food goes out. The wild babies have about 3 months of support feeding (breast-feeding) after they learn to fly, so we use this as the guide. We eventually cut back the food to once a week for the final month. Release cage with covered area over table where we prepare food. 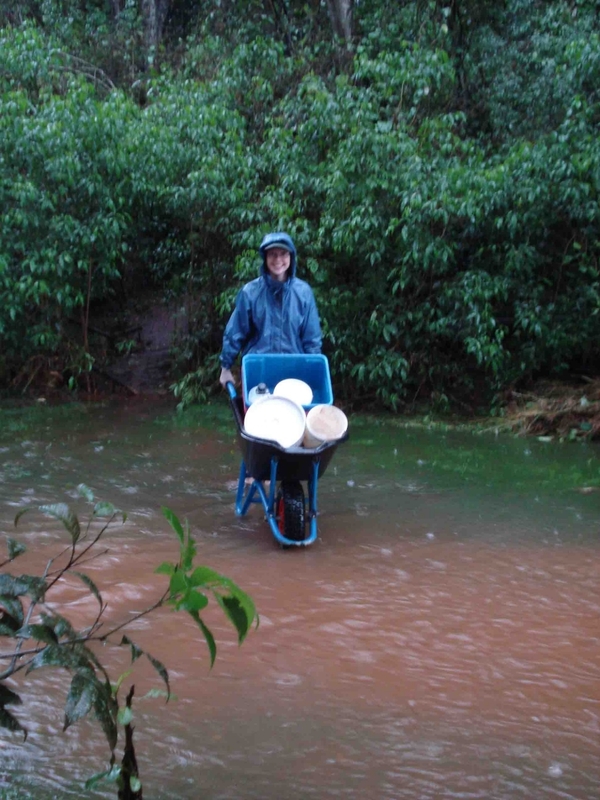 Some days we use a wheelbarrow to bring all the food out. 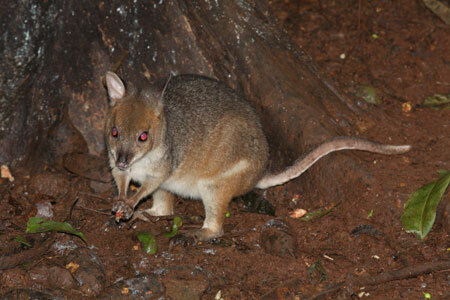 Pademelons and brush turkeys are attracted to this unnatural food source in the middle of the forest. 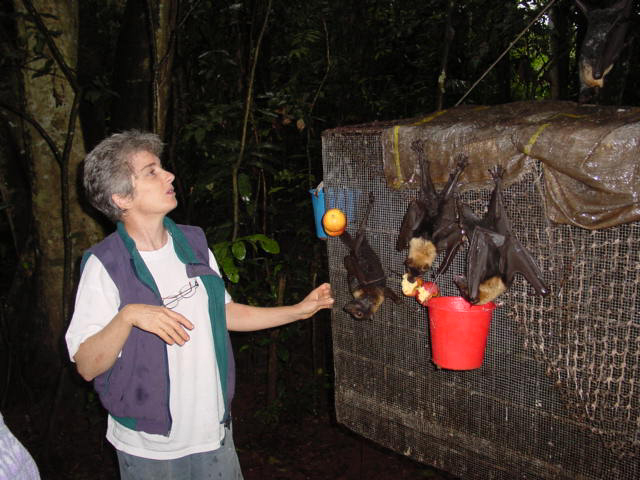 The first year we had orphans to release was 1998 and we released them from home, which is 10 kms by road to Tolga Scrub, less as the bat flies. This proved to be a bad idea. We had a long protracted drizzly winter and the orphans settled on the property down near the creek and flew up to the cage each night for feeding. 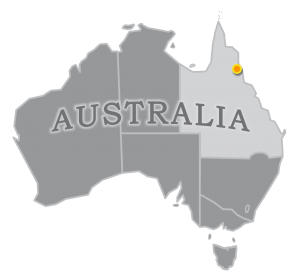 We decided then to ask permission from Atherton Shire Council for a release site at Tolga Scrub and started releasing orphans there in 1999. We were worried about it’s proximity to people – tennis courts, picnic area, public toilets etc and decided to have 2 canopy cages (large dog crates) each operated by a winch. We’d winch it down to put the food on, then winch it back up. If we got there too late the cage would be very heavy with hungry pups. This worked well for a few years but as the numbers of pups increased, the winch system became too heavy. 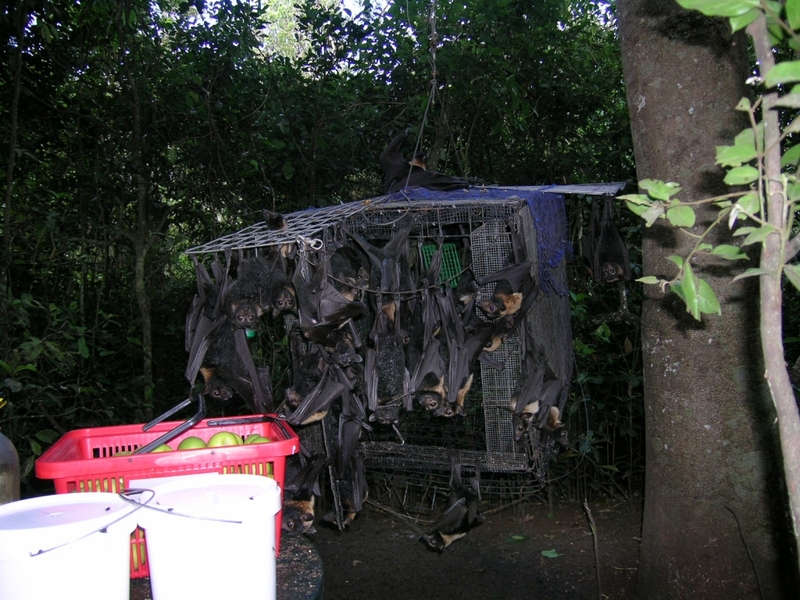 In the final year of it’s use we had over 300 pups to release and joined the 2 cages with a rope on which we hung more fruit than we could fit on the outside of the cages. Towards the end of the support feeding time the pups would wait up in the trees until we’d winched up the cage covered in food. Up up in the air…. Too many bats for the winch system! Arriving too late in the afternoon with the food! We soon realised the pups needed verandahs on the cage, as in the middle photo. Release of the pups is a most rewarding time of the year. A lot of work by a lot of people has gone into the pups so far and we don’t like to cut any corners in the release program. Fortunately the Tolga Scrub is only 10 kms away on the other side of Atherton from the Bat Hospital and we can always combine town shopping. We go to the Scrub daily for several months for the release, just as we’ve gone there daily before Christmas for tick searches. Each year we have pups from previous years coming down, usually within 48 hours of taking the first batch of pups out. Most are big bossy adults by now and show little fear of us, though they have obviously learned to live in two worlds – the real world where they need to be wary of people and the release cage world where people can be trusted. We have had no vandalism at the cage in the many years we’ve been there.